How is everyone’s 2019 going so far? Did you make new any year’s resolutions? Have you kept them so far? We make promises to ourselves all the time (and we break them too), not just at the start of a new year. And many of these promises have to do with our relationships with other people – often either how we are going to change for them, or how we are going to hold them accountable to change for us. Whether this is a good idea or not, can depend on the nature of your relationship with the other person, as well as whether that relationship is fundamentally healthy or toxic. Toxic relationships have many causes – and one of these can be if you are dealing with a narcissist. Teyhou Smyth, the Centre’s London-based therapist, discusses narcissism and gives some excellent advice on how to handle it in today’s Therapists Thoughts blog post. If you have gotten to know a person with narcissism, you are bound to recall how you felt during and after your interactions with them. Not all narcissists are alike. But the term does capture a specific set of traits that are similar in people who are cursed by this fragile, but seemingly bombastic personality disorder. A good working definition of this condition is found on Drugs.com. Often you might miss the tell-tale signs of a narcissist at first glance. Many people who deal with this condition are very charming and sociable. The social skills are often quite good, and one may find many narcissists at the center of the party. Initially, a person who is narcissistic may be flattering and attentive to others. Being on the other end of their compliments and charm can feel truly magical. It is when the shift occurs that the magic fades. The narcissist’s charm and flattery eventually give way to a need for steady adoration and praise. Criticism and manipulation creeps in when the need for ego-boosts isn’t sufficiently met, and the novelty of people and new belongings wear off. For a narcissist, praise, accomplishment and adoration wear out fast; a new supply is needed to fill the void. It is important to differentiate between healthy self-esteem and the more defensive variety of narcissism that is harmful to others due to deep-seeded insecurity. Knowing your value and feeling good about yourself is very different from narcissism. That is an important distinction in our culture, as the term is used frequently and varies wildly from normal self-worth and love. Narcissism can stem from a variety of childhood environmental experiences. People who grow up in highly competitive homes in which their only recognition is for superior achievement. Children who are excessively idealized and practically worshipped by their parents as being perfect. People who were denigrated, neglected and/or had one sibling that was idealized (while they were devalued). These experiences don’t always turn people into narcissists. Some people live through childhood experiences such as these and learn healthy coping strategies. It comes down to internal ego strength. Those with narcissism adopt an extremely fragile ego system and this manifests in dysregulated views of self. Over-confident behaviours and arrogance on the surface masks a deep need for validation and praise. But it’s never enough. That is the curse of the narcissist; the praise, the adoration, all the accolades in the world can never fill that void because it stems from an external source. The internal world of a narcissist is often vacant. When the source of narcissistic supply is depleted (people become tired of the bragging, the arrogance, the self-serving remarks and haphazard insults) a new source must be found. It’s a vicious cycle. Often the narcissist isn’t aware of the pattern and struggles with true self-awareness, as this takes a level of vulnerability and admitting imperfection that is terrifying for someone with this condition. Narcissism is a painful mental health condition. It is painful for the people who love them, and painful for the narcissist themselves. As a stand-alone issue, someone with a big ego is annoying but harmless. A narcissist’s ego is their entire world and they can become emotionally abusive or manipulative to defend it. 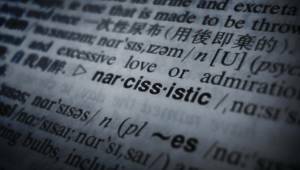 If a person with narcissism feels that someone is advancing on their superior status, or not giving them adequate recognition, they may engage in some negative reinforcements as punishment. In order to re-inflate their sense of self, it often requires the narcissist to put others in their place. This may mean devaluing someone, talking down to them, offering backhanded compliments or judging others harshly to boost their own status. Often narcissists choose partners who need to be “saved” in some way. The saviour role offers people with narcissism a steady supply of ego-feed and this satisfies them for a while. If a partner evolves and becomes sufficiently healthy within their ego strength, a narcissist may feel threatened by their growth and improved status. This perceived threat to their ego may become a point of hostility and the narcissist may either begin to withdraw attention and love or seek to reinstate their superiority through devaluing or other manipulative tactics. If a narcissist feels rejected or perceives the loss of an ego-source, the person is then relegated to the ranks of being useless and without worth. A partner is only as useful as their ability to keep the narcissist feeling good about themselves. It is one sided though, and if the partner asks for similar support, they are deemed “needy” or weak in some way. So even though a narcissist is generally the “needy” one, their needs for ego boosting are the primary focus of the relationship. If this becomes boring, a narcissist may seek new attention and admiration through infidelity. Because narcissists operate out of an internal vacancy, there is often no empathy or guilt for this behavior. It serves the greater purpose for the narcissist, and that is worth the emotional casualties. Those who are in social or work relationships with a narcissist may experience them as braggarts and one-uppers. The friendship or collegial relationship is generally superficial and is simply a platform for the narcissist to flaunt their superiority. Friends and colleagues may leave interactions with them feeling devalued or shamed. This will likely be quite subtle, as there is a need for the narcissist to retain power and this is often through subtle power-plays that fly below the radar. If you find yourself on the receiving-end of a narcissistic relationship, there are some ways to defend your own ego and sense of self to avoid being pulled into that emotional vortex. In partnership with a narcissist, you will likely find yourself giving a lot of praise and support, but not receiving it. Dig deep and offer yourself some of the praise and adoration you deserve. Find healthy emotional reciprocation in friendships. Involve yourself with friends who have the healthy capacity for emotional reciprocation. As much as you might hope for the person with narcissism to learn this skill, it takes a great deal of introspection and empathy that does not come naturally to them. Don’t try to take water from an empty well, you will end up thirsty every time. Recognize it for what it is. Once you see that someone in your life is a narcissist, it is impossible to “unsee” it. When you begin to observe the subtle manipulations and put-downs, try to distance yourself from it. Recognize that this person is wounded and is desperate to feed an ego that is very fragile. This doesn’t mean that you should accept this behavior but distancing yourself from the manipulation can allow you to not take it as personally. When you’ve seen it for what it is and have some capacity to distance yourself from being on the receiving end of the behaviors; it may be time to examine the health of this relationship. Is it serving you? Are your needs important in the relationship, too? Engaging with a narcissist can be a challenging and emotionally draining experience. Make an effort to stay grounded within your own sense of self. Know your own value. Stand firm in your sense of who you are and recognize that your needs are also important. If someone is trying to manipulate you into doubting your own worth, observe that behavior as part of their inner challenges. No one has the power to control your view of self and you don’t need to hand that over to someone who is determined to near it down for their own benefit. A narcissist only feeds on the egos of those who allow it. Disengaging in the game will denigrate your status and worth to the narcissist, and that is a gift that will pay off in the long run.